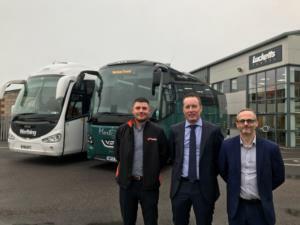 One of the UK’s biggest independent coach firms has appointed two new depot managers as it continues to expand across the south. Lucketts Group, headquartered in Fareham, has made the hires as it cements its acquisition of Mortons Travel and Solent Coaches and sets its sights on further growth in 2019. Stewart Isaac joins the team to head up the depot at Mortons Travel, near Basingstoke. Having worked in the coach industry for 30 years, he brings a wealth of experience to the role and has the unique insight of having worked across engineering, operations, transport and more. He will be responsible for the commercial and operational running of Mortons Travel, which boasts an impressive fleet of 32 vehicles and was acquired by Lucketts Group in April 2018. Meanwhile, Daniel Havers joins the Worthing Coaches team as depot manager. A former British Army soldier, his experience includes utilising and managing a variety of military vehicles. Since leaving the armed forces he has held operations management and transport management roles for multiple clinical waste businesses. Lucketts Group is a strong supporter of the UK’s ex-military community and holds the Government’s Defence Employer Recognition Scheme (ERS) bronze award. It regularly supports former servicemen and women by taking part in resettlement careers fairs and offering positions to transitioning military veterans. Managing director Tony Lawman said: “We saw significant growth in 2018, particularly with the acquisition of Mortons and Solent Coaches. That said, will never rest on our laurels and we are entering 2019 full of ambition.